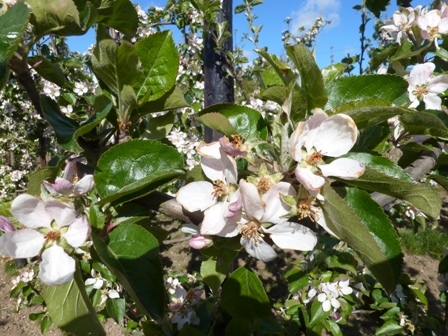 Comparing last week's blossom stages (21st April) with this week (28th April) the blossom development ranges from late bloom on Bladon Pippin to Early Fruitlet on Discovery and Red Windsor. To date no frost damage evident on these trees/varieties here in Hastings Sussex. 4.00pm Tour of orchards, including: 17 hectares of Gala, Cox Royale, Red Windsor, Red Topaz, Crimson Crisp, Scrumptious, Discovery, and Conference pears, all grown organically. Organic top fruit growing is challenging, but Paul Ward has progressed from an enthusiastic outsider to a highly respected and successful organic grower. 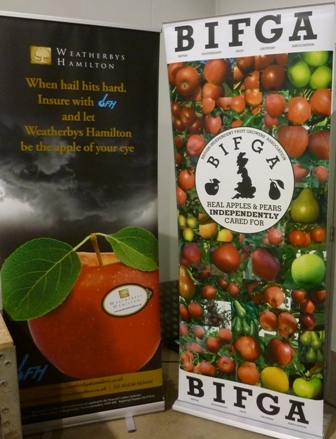 The success of Mole End Farms has been demonstrated with winning entries at The National Fruit Show, where Paul Ward's organic apples have competed with conventional fruit and more than held their own in classes where the challenge of showing apples free from pest and disease is integral to an award winning entry. 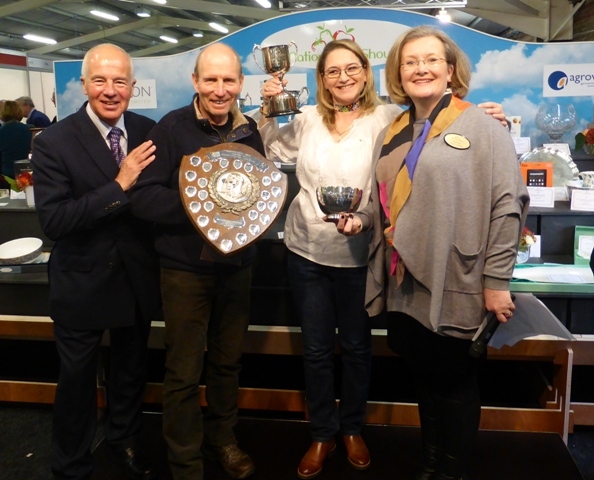 Following success in the 2015 National Fruit Show, Mole End Farms won prizes again at the 2016 show, and won the prestigious 'Tastiest Apple' competition with their organically grown Rubinstep. His organic conversion started back in the 1990's when he bought Mole End Farmhouse with an established orchard of conventional pears. 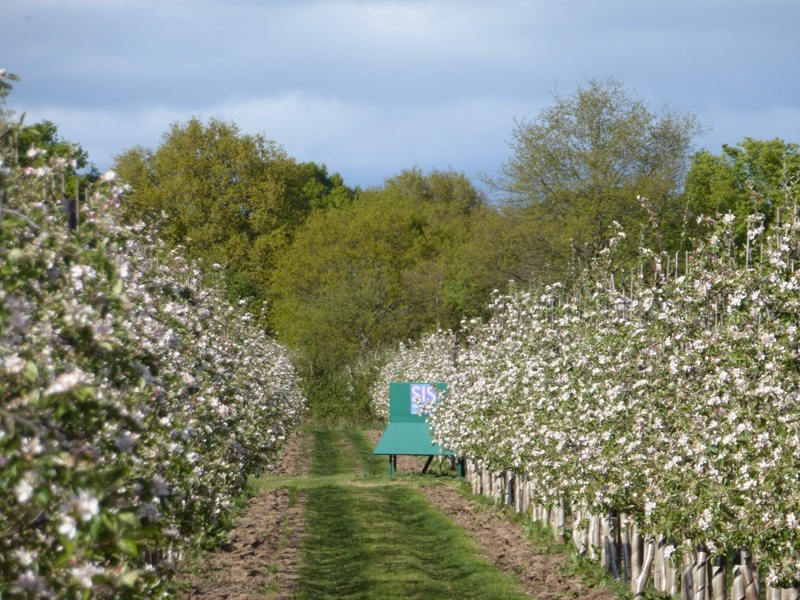 This 'kick started' a sea change from his previous life in construction and soon after Paul added Hartley Lands Farm, a small fruit farm in Swattenden Lane at Hartley near the country town of Cranbrook in West Kent. John Breach introduced UKCA Ltd MD Ken Hatch and his two sons Jon and Graham who presented the companies storage business and their market leading Isolcell Dynamic Control Atmosphere (DCA) installations operating on several UK farms. 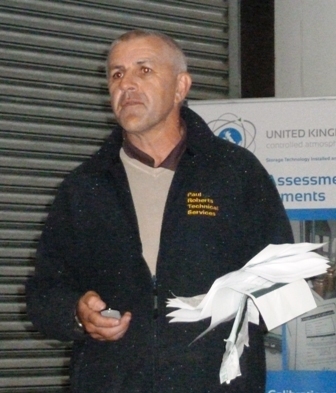 After an initial introduction from Founder and MD Ken Hatch who, having spent many years in the storage industry, started UKCA Ltd with his son Jon 14 years ago. 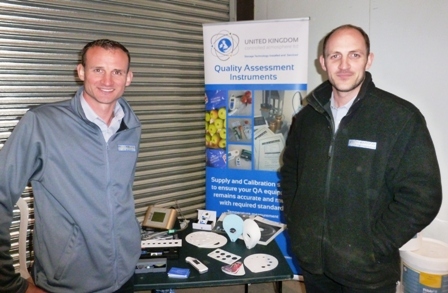 Ken introduced Jon and Graham for an in-depth look at their business which covers installation and servicing of sophisticated storage control systems and as a provider of QC equipment for the produce industry. 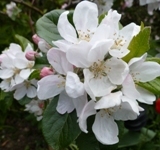 At Hartley Lands, Paul planted two areas with Discovery, Worcester Pearmain, Falstaff, Saturn and Egremont Russet to add to the Bramley which was already in situ. 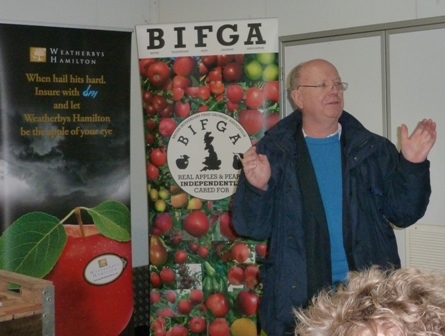 Paul started the conversion to organic in 1997 and achieved Soil Association Organic Certification in 1999. The first harvest in 1998 of 'in conversion' fruit was packed through another packhouse; this however proved too costly. 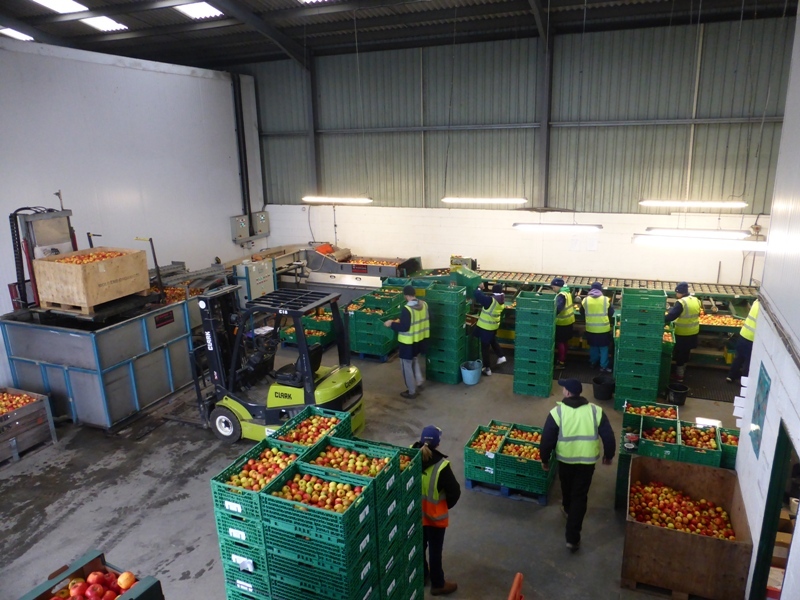 In 1999 Paul started packing at Hartley Lands Farm organic fruit for Sainsburys; this continued for a number of years with Sainsburys, wholesalers and the then fledgling box schemes Riverford Organic and Abel & Cole. The cull fruit destined for juice, processed, pressed and bottled on the farm. From the original area Paul needed more land and initially rented 'Four Wents' before buying the land. More land also became available at Mole End Farm. Fishing lakes were established at Hartley Lands in the millennium as a source of extra income. In total the three sites have an aggregate 65 hectares of organic top fruit. 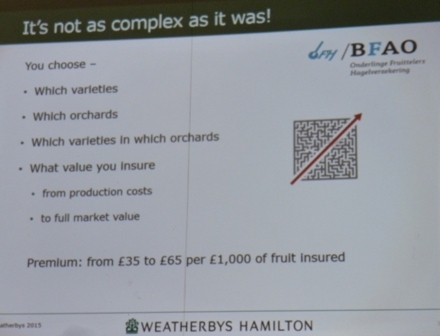 In 2007 the impact of the recession reduced the sales of organic fruit in Supermarkets , fortuitously box schemes took up the orders. The smooth 'makeover' from Supermarket sales to Box schemes brought the added benefit of less stress. Paul said his quality of life improved and reflecting on the cost benefits, he identified £50,000 per annum in reduced costs. The sales profile today is spread between two major outlets and several smaller ones; Riverford take 35% - Able & Cole 35% and 15% is sold through the London Wholesale Markets, 6% through Tesco and the balance via small independent customers. 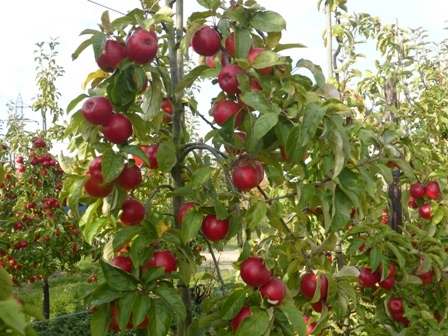 The current variety profile includes; Gala, Braeburn, Spartan, Cox 'Royale' Crimson Crisp, Rubinstep, Scrumptious, Discovery, Worcester Pearmain, Red Topaz, Egremont Russet, Red Windsor, Early Windsor and Pears which are predominately Conference. Controlling pests and diseases without conventional pesticides will always be challenging. The diminishing 'armoury' of available chemicals for conventionally grown produce has been steadily eroded in the last few years, and organic production has lost key 'natural' materials seen as essential to managing pest & disease organically. However Paul follows the mantra that a healthy plant will always be more resilient to pest & diseases, so his philosophy is to create a strong healthy tree, the first step being the quality of the soil in which it grows. The natural toxins in the tree (or any plant mechanism) will 'fight invaders' and great emphasis is made of regular soil and leaf analysis. By rotating soil sampling each year with a 5 year cycle if all is well, supplemented with extra samples if required and 'yearly sampling' if necessary. An important element in delivering Paul's healthy soil management is the input from Simon van der Slikke an independent agronomist and proponent of healthy soil management as the key to successful growing. 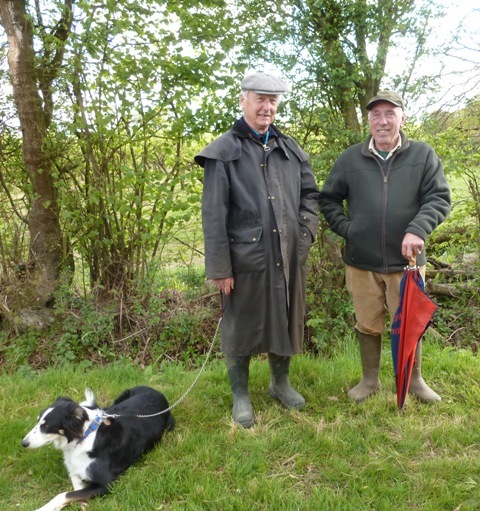 Simon is now retired, but maintains his passion by advising Paul Ward on soil quality and nutritional management. One of the many indicators of good tree health combating disease, is demonstrated by the variety Crimson Crisp which has an Achilles' heel in the face of Mildew infection. The propensity for mildew infection in organically grown Crimson Crisp at Mole End Farms is well below the levels observed in conventionally grown trees on non-organic farms. Returning to available organic materials; Copper and Sulphur have been at the heart of controlling scab and mildew. Very Low doses of Copper have helped to stimulate natural plant defences to keep scab infection under control aided by sulphur. A 6 year study from 2003 until 2009 at the 'Centre wallon de Recherches agronomiques', at Gembloux in Belgium showed that a combination of low rate copper and sulphur consistently increased yield, even in the absence of disease. The new rules governing the use of Copper meaning it cannot be used as a fungicide, but can still be used as a bio-stimulant, have not impacted on Paul Ward's scab control, as the rate used at Mole End Farms has always been low (well below the permitted 'fungicide' rate) and is still below the new rate allowed as a bio-stimulant. 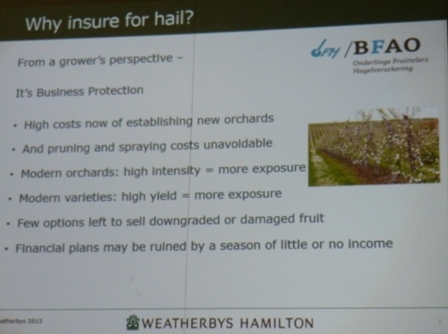 Interestingly, Copper can still be used as a fungicide at a rate of 4 x 2kg per hectare on vines! The combination of low doses of copper used as a bio-stimulant, with sulphur and potassium carbonate (as a separate tank mix) is integral to Paul Ward's early season spray programme. When rainfall occurs it is policy to spray with potassium carbonate as an eradicant within 3 days of infection. Paul uses a Sulphur, Potassium Carbonate and Worm juice mix for mildew control. Paul uses routine humic acid (worm juice) and seaweed applications. Humates relieve plant stress and application on wheat crops have proved to be 90% as effective as irrigation; the point illustrated is the 'status' of the plant health when suffering drought conditions determines the plants ability to withstand periods of low rainfall. Worm Juice provides a wealth of nutrients and minerals (over 60 different nutrients. It's the enzyme in the worm's digestive system that allows all the nutrients and trace elements to become water soluble, and therefore readily available for plants. Compost worms are not the same as garden earthworms - they live closer to the surface, prefer wetter conditions and eat fresher organic material like manures and mulch. Other pests are monitored using moth traps. 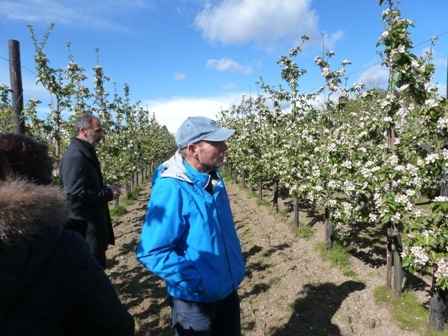 All Mole End farms orchards are walked weekly during the season by Simon van der Slikke and Farm Manager Nicola Ionita. 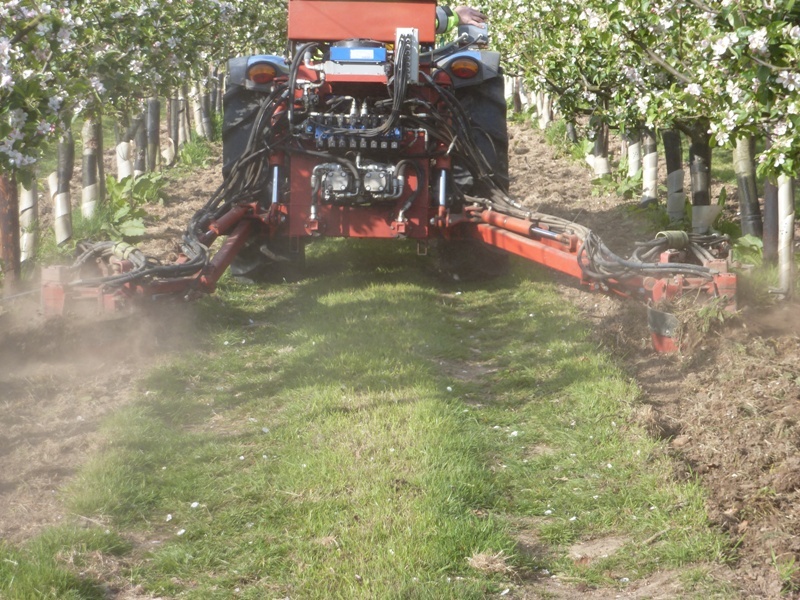 Tree and soil health is paramount; ensuring healthy soil structure is the key; Simon van der Slikke comments on how important it is to get the soil right before planting a new orchard. He recounts how many growers grub and replant a new orchard in the course of one winter. 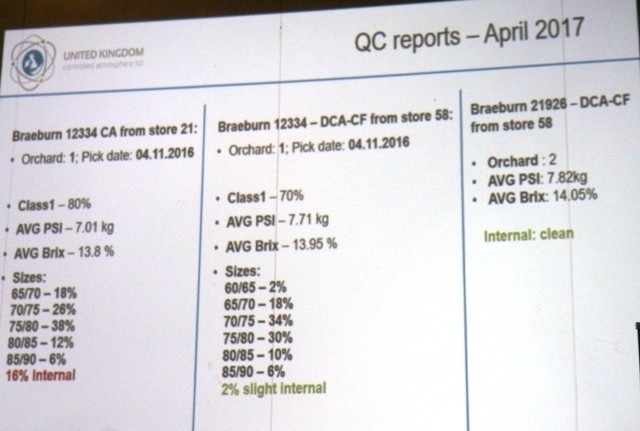 He despairs at the explanation - "cannot afford to lose a year's production" - Simon observes the performance of the new orchard having had a year to regain soil health, will more than make up for any perceived loss of revenue. 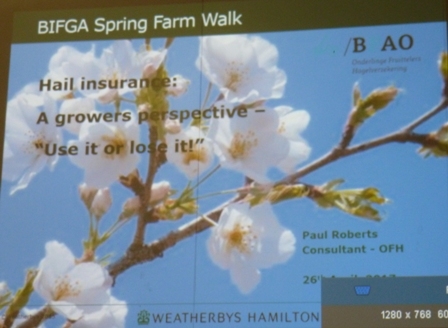 Managing the grass sward to optimise the nutritional and environmental benefits. Paul 'scalps' the sward in early spring to reduce the risk from frost, then manages it to a height 4-6 inches to maximise insect life within the sward. Soil cultivation beneath the trees is maintained with an in row cultivator. Green waste (compost) plus chicken pellets (Nitrogen) from organic chicken farms are used to deliver nutrition; Simon van der Slikke points out the danger of locking up other nutrients, for example; Calcium when phosphates are too high. Simon carries out a programme of soil and leaf analysis for Paul and samples soil every five years with 4-5 leaf tissue analysis each season. A prime target is calcium and monitoring Nitrogen to see if it is too high. Boron can be low and sometimes Iron. 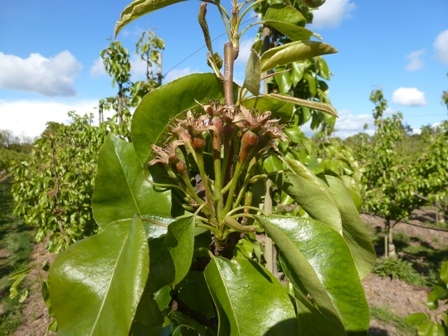 Manganese deficiency can be identified by spraying manganese on leaves on a sunny day and then extracting the juice, before testing the brix level. If the brix level rises, the tree may be deficient in manganese. Measuring the organic carbon to nitrogen ratio at the growing point should be circa 15-20 to 1. Discussing the use of compost, Simon stressed the importance of how compost is spread; the danger of creating a cap under a solid (deep) layer of compost is real; unlike straw which breathes, compost badly applied staves the soil of air. 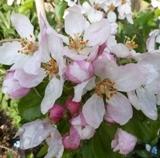 Recounting an instance where a badly performing orchard had a copious application and continued to show symptoms of ill health, lightly cultivating the top soil around the trees allowing the compost to work its way into the soil produced a dramatic recovery in tree health. 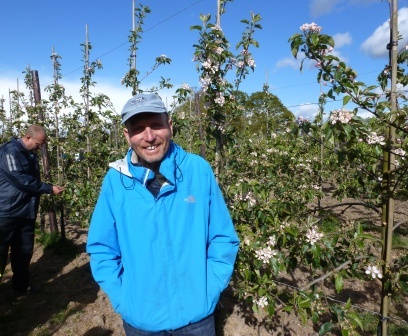 Discussing organic v conventional yields of apples, Simon van der Slikke said Gala crops of 40 tonnes per hectare have been achieved at Mole End's Four Wents Orchards. 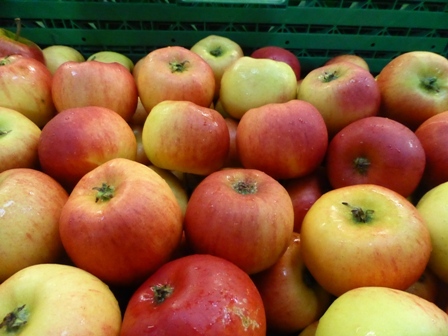 Generally organic apple yields are circa half of conventional crops; 25 to 30 tonnes per hectare in full production is the target. Paul Ward is understandably proud of the Mole End Farms business which meets all the principles of sustainable fruit production. 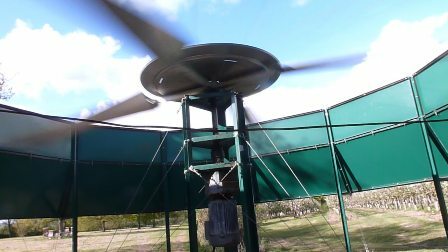 Paul not only looks after his trees but his staff and the environment. The staff are highly trained, motivated and work together as one exceptional team. Organic fruit production uses a minimal number of approved natural products for the control of both disease. the fruit and foliage from disease, soap solutions for the control of aphids and some o. 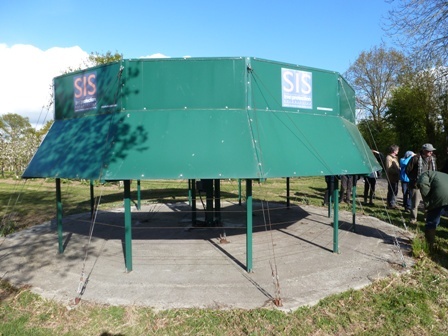 Soil fertility has been maintained by the use of clover grass leys, mowing and mulching with cuttings and where necessary the addition of natural composted manure and approved organic fertilisers. Weed control has generally been achieved by mowing and mulching, appropriately timed cultivation is also employed. Conservation and bio-diversity are essential tools in organic production systems. As many areas as possible around our farm are managed exclusively for wildlife, flora and fauna to sustain and encourage a bank of beneficial insects and protect an ever-diminishing variety of wildlife habitat. For example seaweed extracts, to improve leaf and soil quality, sulphur to protect the fruit and foliage from disease, soap solutions for the control of aphids and some other damaging insects. Soil fertility has been maintained by the use of clover grass leys, mowing and mulching with cuttings and where necessary the addition of natural composted manure and approved organic fertilisers. Weed control has generally been achieved by mowing and mulching, appropriately timed cultivation is also employed. Conservation and bio-diversity are essential tools in organic production systems. As many areas as possible around our farm are managed exclusively for wildlife, flora and fauna to sustain and encourage a bank of beneficial insects and protect an ever-diminishing variety of wildlife habitat.